In a small bowl mix together Dijon mustard and honey to make the sauce and set to the side. Lay out a large piece of aluminum foil. 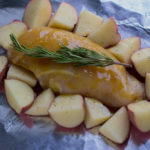 Place chicken on top of the foil in the center. Place potatoes around the chicken. Drizzle everything with oil and season with salt/pepper. Pour sauce over chicken and place rosemary on top.